Canoli boxed lunches include: Choice of Homemade Canoli, a side of Elaine T. Valente’s Homemade sauce, a bag of Boulder Canyon Chips, a freshly baked gourmet cookie and a dill pickle. Utensils and napkins are also included. 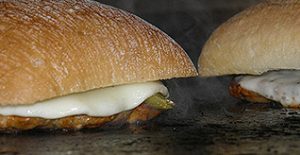 Valente’s homemade Italian Sausage, layered with mozzarella cheese and a green chile strip, wrapped in dough and baked. Valente’s homemade meatball, layered with mozzarella cheese and a green chile strip, wrapped in dough and baked. Layers of Danish Ham, Sliced Pepperoni and mozzarella cheese wrapped in dough and baked. Layers of Green chile strips, Roma Tomatoes, Black Olives and mozzarella cheese wrapped in dough and baked.